In the News! Archives - Don't Be a Cow! Mentions of George or Rachel Barker, Don’t Be a Cow Authors, in the news. Asheville, NC, March 31, 2019 – Don’t Be a Cow! had its hands full this weekend at the annual LIVE WELL EXPO in Asheville, NC. The 6th annual Expo presented by First Bank, Ingles Markets & Mission Health was held on Saturday, March 30 at the Davis Pavilion at the WNC AG Center. There were over 100 vendors and 9,000 plus attendees. 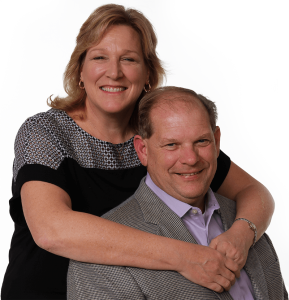 Both George and Rachel Barker, the authors were on hand along with Gary James, web manager, jamesgang creative communications. People from all over the region and all walks of life attended the event. There were many in health-related professions themselves such as nurses, PTs, and senior living and home-health practitioners. But, many folks who attended clearly are in the demographic who are not fortunate to have the finances for the healthcare and all the services they need. The event drew attendees as far away as Cherokee and Tennessee. Doors opened at 9am, and the crowds were already lined up to take part in the event. In the past, LIVE WELL EXPO had focused primarily on health-related services such as senior living, hospital care, first aid and nutritional advice. This year, the expo was opened up to include all sorts of “living well” providers including the trending CBD oils, therapeutic massage, Sleep Number® and there were even seeing-eye dogs-in-training. Don’t Be a Cow! had a unique position as being the only lifestyle provider promoting “Living a happier life” by offering a 31-day interactive guide to happiness. In addition to the book, there were Don’t be a Cow! mugs, bookmarks, and of course, Jolly Ranchers and dum-dums. Occasionally, folks who visited the booth, who shared their laughs, told their own remarkable stories of courage and journey through adversity, received a complimentary mug or book. Coincidentally, on Saturday, The Washington Post did a story on how we are all overloaded with stress and offered ways to cope. And recently, it was reported the hottest class at Yale is “The Science of Well-being” with takeaways from that class being some of the exercises offered in the book. Don’t Be a Cow! An Interactive Guide to True Happiness, by George and Rachel Barker, is available on Amazon.com. In the News!, Live Happy. Live Well. We are thrilled to be included in this list of books to read to improve social skills. And we’re in very good company. Please take a moment to look at the list, make a comment or share. It will mean a lot to us. And if you don’t have a copy of Don’t Be a Cow! or would like to share with a friend or family, be sure and take a look! Many folks have told us we have already empowered them to “find their own paths. The Tallassee Chamber of Commerce held the annual Chamber Banquet last Thursday at the Civic Center in Wetumpka. 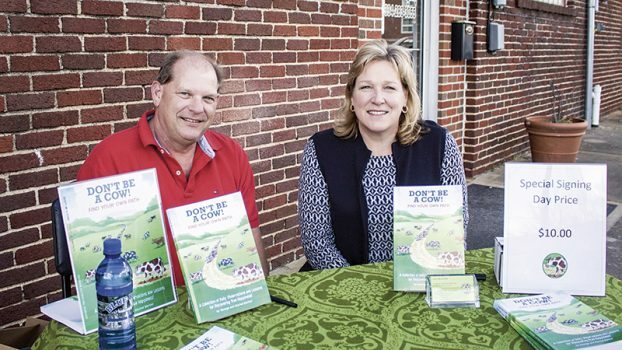 This year’s keynote speaker was George Barker, who along with his wife, Rachel, wrote the book, “Don’t be a Cow! Follow Your Own Path.” Barker explained the importance of happiness and strength.